In last month’s antitrust case in Oakland challenging the artificial caps on athlete compensation, the NCAA’s defense included the restatement of an imaginary economic principle that is fundamental to its existence: College athletes shouldn’t make money, the NCAA argued, because if players were paid above some magical line, consumer demand for the product would plummet and the golden goose would stop laying its billion-dollar eggs. The thing is, though, that even way back then, the NCAA’s claim—that fan interest would evaporate if schools did not agree to cap compensation at the magical line between amateur and professional—was false. Patently, demonstrably false. Prior to 1948, the NCAA never asserted any right to actually enforce its amateur status, leaving it to each conference to assess its own fans’ competing desires—for high quality play on the one hand and for amateurism on the other—and make offers to athletes consistent with its own assessment. Schools did different things. Big Ten schools did not give scholarships, but they gave their athletes jobs on campus. (Yes, they were employees of their schools despite Mark Emmert’s claim that such a thing is incompatible with college sports.) SEC schools gave athletic scholarships that included cash stipends. Starting in 1948, the NCAA tried, but failed to enforce its rules, and did not succeed in establishing real national oversight until 1956. So we have a hypothesis, which just so happens to be a crux of the NCAA’s legal argument: Paying higher than the amateur line will destroy demand for college sports. And we have had multiple tests of that hypothesis: Many schools in major college football and basketball paid their athletes more than that. College sports are more popular and more profitable than ever. The only scientific conclusion is to reject the hypothesis. Rather than heed the scientific method, the NCAA’s response is always to move the goalposts. But of course the claim that people only watch college sports because the athletes are kept artificially poor is, at core, utter rubbish, and the NCAA keeps moving the magical line higher. Starting in 1956, the NCAA defined the level of compensation beyond which one would be considered a professional as a Grant-in-Aid and set the GIA limit as tuition, fees, room, board, books and necessary supplies, plus a $15-a-month stipend. (Remember that $15 went a lot father back then. It’d be like $140 a month now). This stipend was known as “laundry money” because in the sexist culture of the 1950s, it was seen as impossible for a young man to do his own laundry, so of course he needed money to pay a woman to do it for him. So for the period from 1956–1976, we had a test of the view that any money for athletes would kill college sports. Yet despite the scholarships and stipends, college sports remained extremely popular. So right away, this was proof that the former line, extant for a half-century, had been wrong. Then in the 1970s, America as a whole hit a bad patch, economically. Inflation was high, growth was slow. Basically, everyone felt like they were earning less and things were costing a lot more. Schools were no different, so they gathered in Chicago in August 1975 and declared that the amateurism standard that had served the industry for the previous two decades was too generous and needed to be curtailed, lest college sports die. Not because fans felt athletes were insufficiently amateur, but rather because schools’ competitive urges were leading them to spend more than was prudent in those tough economic ties. In other words, it was a decision to fix prices to save money. I’ve read the minutes of the meeting—they are available in hard copy at the University of New Mexico and Northwest Louisiana State – but if you don’t want to travel there, you can see some of the relevant quotes in the public version of another of the court filings in the Oakland case (read pages 51-56). If you read it, you will see that no one in the room expressed a single concern that the problem was with alienating fans. It was, in every sense, we’re spending too much money and we’d like to spend less. There is an economic term for when a group of competitors agrees to a maximum price each will spend on a needed input to their product. The term is “cost-cutting cartel” and that is what the NCAA revealed itself to be when, starting in 1976, it rolled out its new definition of amateurism by redefining the GIA to exclude necessary supplies, to exclude any book recommended by the professor but not required, and to exclude the “laundry money” stipend. So now we had a new hypothesis to test. 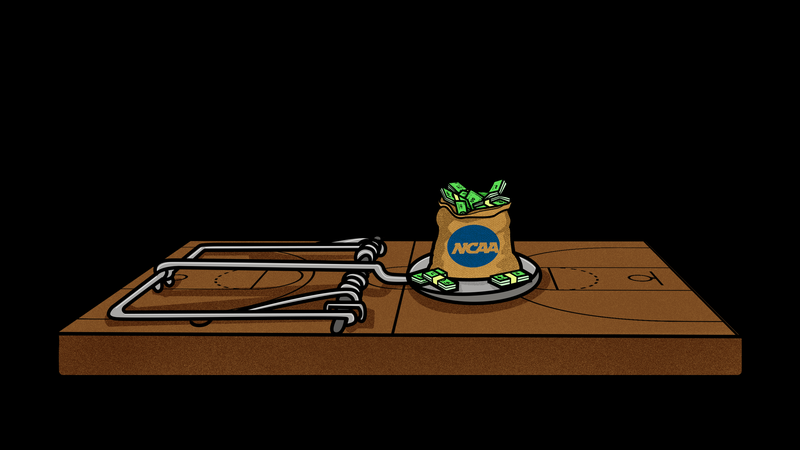 If the NCAA’s assertion is that consumer demand will decline if athletes receive more than their definition of amateurism, then it should hold that when athletes received less money, demand should have immediately shot up. There is no evidence that it did. And yet that rule remained on the books as the NCAA’s definition of the line beyond which the sport would collapse, all the way up until Aug. 1, 2015, when the magical line moved yet again. During that period from 1976 through 2015, multiple lawsuits were filed, and multiple arguments were made by the NCAA that if athletes got more than the GIA limit, the sport would collapse. In 2007, the NCAA brought out several witnesses who said that if athletes got cash payments akin to laundry money (but updated with the less sexist term of “cost of attendance” stipends), that would amount to “pay for play.” These witnesses included current NCAA VP Lynn Holzman, former NCAA VP David Berst, and expert MIT economist Jerry Hausman. Well, as we know, in the wake of the O’Bannon trial, when many witnesses testified that they did not see any justification for capping pay below cost of attendance, even though the NCAA had been doing so for almost 40 years, the NCAA relented and allowed the Power 5 conferences to start paying more. Laundry money was back, baby, in the form of COA stipends which in some cases exceeded $6,000 per year. And so we had yet another test of the NCAA’s hypothesis. And now, with more compensation allowed, college sports’ popularity did not drop and did not spike, but continued to grow at the same pace. Athletes are now being paid more, and nevertheless college sports continue to exist! Did that make the NCAA admit their inability to identify the magical line, or admit any doubts as to whether there even was a magical line? Not at all. It denied that the change from the old cap to the new cap was even relevant because, as it now claimed, the cap did not really change at all. The explanation for this stretches belief. Beginning in 2004, schools had been allowed to give the most academically gifted athletes an income supplement from an academic scholarship to provide that COA stipend, so the fact that in 2015, suddenly everyone was getting the stipend was not a change at all. This does not demonstrate what the NCAA thinks it does. If the change came in 2004, then the fact that NO ONE EVEN NOTICED is very strong evidence that the 1976 line was wrong. But back in 2004, of course, the argument was that it was okay because this supplemental income was unrelated to athletics, and indeed, it was alleged that if every athlete, not just those on academic scholarships, could get their full COA, it would be “pay for play”—exactly what happened in 2015, when the NCAA would retroactively claim that universally available COA stipends were simply status quo. See what’s going on here? No matter what the prior justification was for the position of magical line, when the line changes the argument becomes that we all simply misunderstood the old line. This is gaslighting—when a person or organization in power tells you that your own memory of a contradiction is faulty, that rather than their having been wrong, you are the one who’s failing to remember how things really were, and thus can’t understand how they are now. Here is what NCAA gaslighting looked like in the recent court case in Oakland, where University of Virginia economist Kenneth Elzinga claimed that the NCAA rules on what constitutes the magic line had never changed during the hundred years of history I’ve laid out above. Do you see where he’s sneaking a rabbit into his testimonial hat? He’s not saying the RULES didn’t change—the actual definition of the magic line—he’s just saying the justification has never changed. In both 1912 and 2018, the NCAA has claimed that if they don’t restrict earnings, athletes will not be amateurs. But Elzinga’s testimony does not engage with where that slippery line might be. The line even changed during the course of Elzinga’s work on the case. In his first report in the matter, he explained that even “a penny” of non-educational compensation would destroy demand for college sports. That’s a pro-NCAA economist changing his definition of the magical line in real-time. In other words, how could you possibly think that when he said the rules about paying athletes with Xboxes for going to a bowl game were “not related to the principle of amateurism,” that he possibly meant anything other than that those rules are totally related to preserving amateurism? Gaslighting. Another piece of evidence brought up in Oakland was the notion that from 1956 forward, once the NCAA grabbed the power to enforce its magic line du jour, schools frequently broke the rules. Athletes lost their eligibility, and even once, when SMU was found to have egregiously flaunted the rules, it was banned from having a football team for two years, the so-called death penalty. In his testimony (at pages 51-55), Roger Noll rightly pointed to these as examples of the magical line being crossed without harm to fans’ interest in college sports. College football is orders of magnitude bigger now than it was when SMU was executed, and has thrived in the face of numerous programs committing violations. My favorite example of this sort of “scandal” was when Ohio State players had the temerity to sell their own property to pay for tattoos, and were suspended for half a season—an extreme penalty in the NCAA system—but were allowed to play in the Sugar Bowl against Arkansas because everyone wanted to see that looming clash of the titans. The TV ratings were historic because it promised to be the highest quality of football. No one seemed to care that a large chunk of the Ohio State players were not amateurs under the rule in place at the time. And so we come to the scandal of the day, the criminal fraud and corruption cases currently being tried in federal court in New York City, in which several non-NCAA members are accused of defrauding major college basketball programs by providing side payments to athletes to ensure they attended those schools. The government’s theory is basically nuts, because it relies on the premise that when a sneaker company pays an athlete to go to a school that wears that company’s shoes, that school is somehow harmed—of course, we all know that schools hate getting great athletes who can pack their arenas and help generate donations. Both the government and the defendants in the case admit that money was given to athletes. In some cases, these athletes played for those schools—e.g., Dennis Smith played a year for N.C. State and the Federal Government alleges, and the defendants do not dispute, that he received $40,000 on top of his scholarship to do so. He was, so to speak, paid and he played. And no one cared. Where’s the magical line? Smith finished his college career without detection by the NCAA’s beat cops. The allegation of Smith’s payment was leveled a year ago. N.C. State has not been charged with an NCAA violation. N.C. State has not seen its fans storm to the athletic department offices and demand that the AD or the compliance staff be fired for failing to catch this egregious violation. No. One. Cares. So what should we expect to see when college basketball tips off next month? If you believe the NCAA’s “amateurism” hypothesis, it’s now clear that many of the best athletes in college basketball were paid by third parties to play for their AAU teams, and many were also paid to choose a school based on the shoe company those schools have contract with, so the inescapable result is that consumer demand for college basketball will plummet because of systemic payment above the magic line that was not kept under control by rigorous NCAA enforcement efforts. Once again, the “Amateurism is Essential” argument will be put to the test. Be ready for it, because if the NCAA is correct, then College Basketball May Die Next Month. People might boycott in droves. And if so, the elusive magical line will finally have been found. But if instead what we see is business as usual, maybe this time we’ll finally stop accepting the ever-shifting goalposts, the amateurism gaslighting, and just acknowledge that what fans care about is college sports played by college athletes, no matter what they’re earning. Andy Schwarz is an antitrust economist and partner at OSKR, an economic consulting firm specializing in expert witness testimony. He is part of a new project, HBLeague.com, working to create a non-amateur version of college sports. Follow him on Twitter, @andyhre.